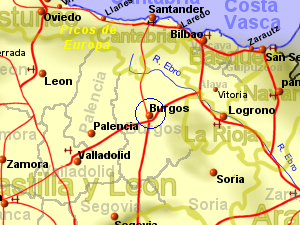 Burgos,at a height of 890m and with the Atlantic coast approximately 120km to the north, there will be no winter warming effect by the sea. There will be a chance of night time frost in the winter and a chance of snow. Summertime average temperatures are amongst the lowest for Spanish cites though daytime temperatures are likely to be very good in the sunshine. The altitude effect will mean cooler temperatures when the sun is not shining.